Canvas and Cuisine: The Art of the Fresh Market is a passport, inviting you to visualize the Italian seaside town of Positano where merchants offer baskets of produce featuring locally grown vegetables. The burst of color and depth of texture shows a zest for life. Home cooks feel the same way as the painter, plating meals for the people they love. The foodie consumes, the artist memorializes; and in this book, they come together as one hungry entity looking to be sated. Canvas and Cuisine ensnares the senses of both the cook and the artist. We take gorgeous food, chat about its use in native cuisine and then bring it to the home cook’s kitchen. Open this book and you’ll see a basket of potatoes in a Madrid open air market that inspires Patatas Bravas, a tapas dish with a kicked-up spicy sauce. You’ll see a painting of crates holding indigo-hued eggplants that inspires a dish of Vietnamese stew. You’ll see a bustling square reminiscent of London’s Borough market that inspires a dish of English cheddar, apple and sausage stuffed acorn squash. The authors of Canvas and Cuisine know this truth: beauty of different cultures come through best in their native foods. At first glance, some of the recipes in this cookbook’s pages seem exotic – but make no mistake; these foods are simply local and fresh, and they easily find their way into your kitchen. 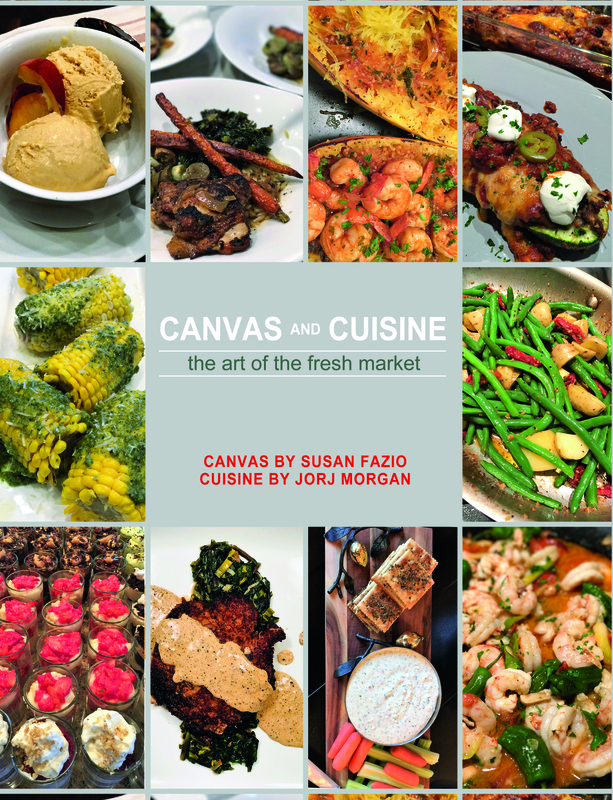 Canvas and Cuisine illustrates how to make the looking and the gathering of ingredients fun – an activity that brings family and friends together. Jorj Morgan is the author of six coveted cookbooks. She is committed to helping time-constrained home cooks prepare nourishing, delicious meals for family and friends. She has a penchant for classic comfort food, served with a gourmet twist. Her expert foodie status comes from decades of experience in party planning, cookbook marketing, brand advocacy and media campaigns, blitzing her recipes across popular blogs, Facebook, podcasts and Twitter. She is an experienced public speaker and cooking class instructor. More than just recipes, the traditions and philanthropy shared by Jorj’s kitchen benefit today’s families. To enhance her cooking, entertaining and lifestyle books, she maintains an active blog on her website www.jorj.com. Susan Fazio is enthusiastic, energetic and purely present. She received her Bachelor of Arts in Fine Arts and a Doctorate degree in education from Florida Atlantic University. Sue’s work can be found in studios in Hendersonville and Banner Elk, North Carolina, and Stuart, Florida. Her mediums include pastel, oil, acrylic and encaustic. She teaches at the Bascom school of Art in North Carolina and the Lighthouse School of Art in Jupiter, Florida. All proceeds from her work goes to The Boys and Girls Club of Henderson County in Hendersonville, North Carolina, which is the club she and her husband, renowned golf course designer Tom Fazio, founded and funded in 1991. She travels all over the world, painting city scenes, landscapes and of course... fresh markets! Her works can be found at www.suefazio.com.